This summer I have been going every weekend for a one day beach trip. It is a 10 hour drive overall for one day and although I love spending time on the beach I have to admit that this arrangement is completely exhausting. As the drive itself is at times hard to bare I like to reduce the traveling effort as much as possible. This includes light packing and taking only the most necessary things with me. The number of things to pack for a one day beach trip has been fine tuning during all my traveling weekend days so now I can give an honest and totally practical advice on this subject. I did it for my friend who decided to join me last weekend. As I sat there on the phone telling her what to take and what not I realized that there are people doing this for the first time and they may be a little clueless with the packing list. So here is my complete list and I have included the most important things first so you know what to pay attention to most. Like I did haha! It truly happened to me one time: I took all the cents and 1 or 2 euro coins but I left the main money in the drawer. I guess was too tired from work and the trip was only a few hours away. Luckily I had a friend with me who borrowed me some money. I had my international Payoneer card with me with a decent amount of money on it so I would not have died out of thirst – but a horrible day I would have had. Or maybe I would have worked my way out somehow – who knows? Since this happened to me I always pack the passport and the money first. They are top priority on the list. I must admit: I am in love with backpacks. To me they are one of the best products ever invented. They can be used in so many ways, they are durable and you can always make a use of a good backpack. Even if it sits in your closet for years I bet the day will come when you will remember it and use it! I have a black and pink backpack – you can see it in the first image that my little (new) kitty really likes and every time I take it out it tries to crawl inside. It’s really a hiking backpack with heavily padded straps and air breathable back but these things are not really required for a one day trip to the beach. I did a little investigation and found a good looking, light backpack that I think will be perfect for this purpose – in case you don’t already have one. I don’t know about you but I like having my hands free in everything I do and backpacks allow me exactly that. I really don’t recommend you take one of those over the shoulder beach bags. They are great if you are on a real vacation for many days and you need to just transfer your stuff to the beach. But when you travel that is another story. Your things need to be tightly packed and safely zippered which those beach bags often don’t offer. 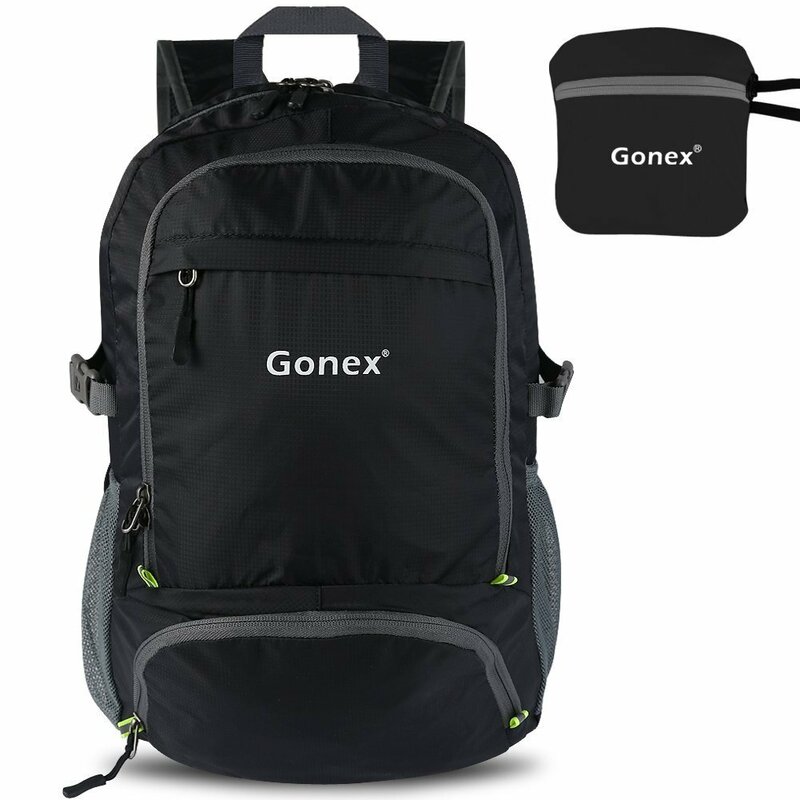 What I like best on the above backpack is that it is light weighted, big enough to hold your one day travel things, it has front compartments for easy reach (perfect for your passport, cigarettes if you smoke or wet towelettes). And there is something that comes along that I am almost sure you will forget: you can see the additional little pouch that is included. Here is what I mean: when you get to the beach you certainly don’t want to walk to the nearest coffee bar carrying the whole backpack. You’d look like an elephant in a porcelain store – so to speak. You need something much smaller to hold your money, passport, chewing gums etc. when you sit for a coffee of juice. This little pouch will serve you perfectly for that. So in case you need a good and inexpensive one-day-travel-to-the-beach backpack I belive this is a very good choice. Here is a very good video review of this backpack in case you are interested. A swim suite and a beach towel are also very high priorities for a one day trip to the beach. But it is not the end of the world if you forget them if the beach has local stores. The beach stores have all the necessary things that humans need when they got to a beach – and this includes beach towels and at least some types of swim suites. In fact the beach store in the place I go to has the most beautiful beach towels I have seen, very vivid colors and the size of these towels is huge which I really like. Even though I already have a nice beach towel I am still going to buy one of those – that is how great they are. Here is a little trick I do to make sure I don’t forget my swim suit: I actually wear it on me. No chances to forget it this way, it’s very efficient. 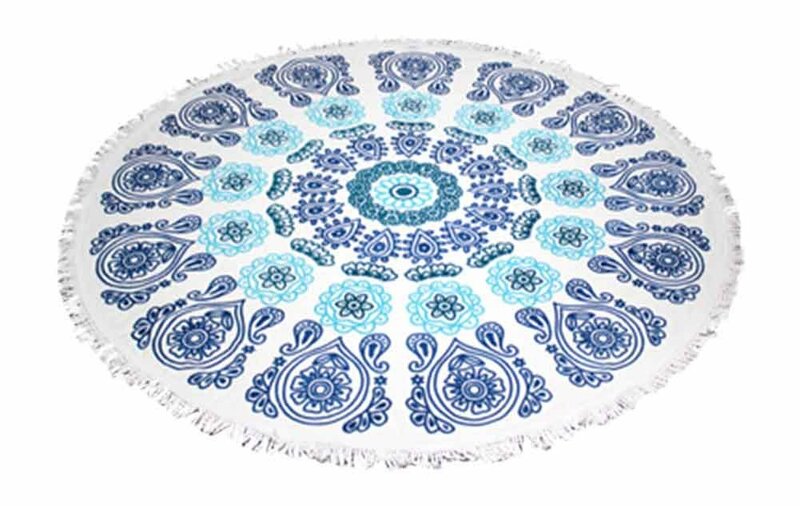 This must be absolutely the most beautiful beach towel that I have ever seen: from the shape to the colors. Stunningly beautiful! The quality of the material is also there: it is made of 100% velour cotton with tasseled edge. The size is also very good: 1500 mm (1 and a half meters) which I think is sufficient for most of us. It is also thick and absorbent – just like a standard towel. 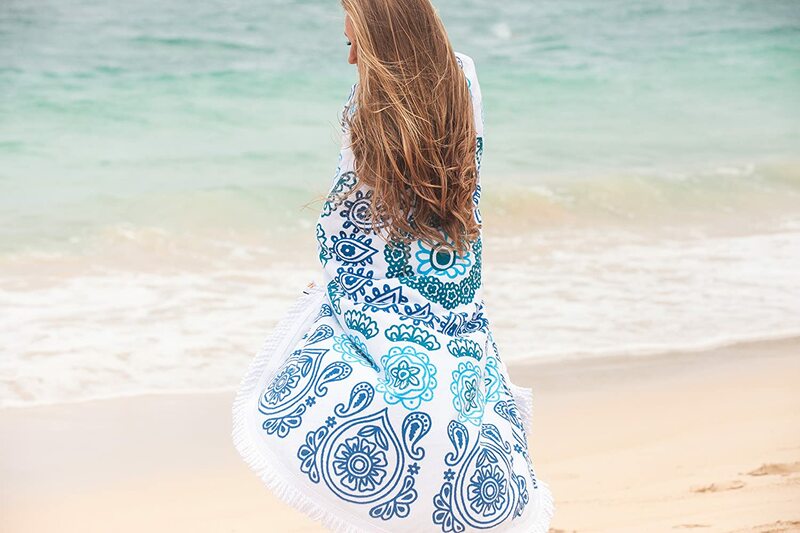 If you have the possibility then by all means get this beach towel: you will so unique on the beach and unforgettable. I have to warn you though: it is a one person towel so that you plan it correctly. This is a must have item for a beach but it is not the end of the world if you forget it: most beaches have sun screens that you can purchase in their local stores. But if you want to save some money and get the brand that you are used to and like then you better pack it in the backpack. If you have sensitive skin and get rashes easily then this is definitely an item that you must not forget. This is a pretty important item if you don’t want to burn your feet on the hot sand. And it is an item that you can easily forget about – at least I had hard times remembering to pack them. In case you forget them you can always use your traveling shoes, which are snickers in my case, but that would be such a drag in the hot sun. And you’d have to be careful not to wet them before you go back as traveling in wet shoes is certainly not the most comfortable thing in the world. So be sure to pack your favorite pair of beach flip flops! Underwear – this I use on my way back home as the swim suit is wet at the end of the day so I need something dry and clean. Toilet Paper – this is really optional but I like to use my own instead of the public ones. It is more hygienic to me. Entertainment – I usually take a book or I download something on my mobile to read. A tablet would be perfect for this purpose but I don’t like to carry it as it is too much burden for me for one day. My best indicator is if you will travel at night or by day? There is big difference. If you travel by night be sure to wear warm clothes. Although it is summer temperatures do get low during the night and it is best if you have something warm. If you are hot you can always take it off. Do you travel by car or with a bus? The buses have air condition that will not be adjusted according to you. Usually they lower the temperatures and in my case they lower it too much so I always use a sweater during my night travels. If you travel by day only then wear something light and easy, summer days are extremely hot. Here is what I wear: very comfortable and soft long pants, a T-shirt, sneakers and I always carry a sweater. This little red travel pillow is my saver and I always carry it with me. A long bus trip is MUCH more comfortable when you have something soft and supporting to lay your head on. Especially if your seat is not next to the window. I actually think I could not survive such a seat without my red traveling pillow. There is one trick on this pillow that makes it a perfect beach/sunbed pillow as well: it has a button that brings together both sides so I have one peace elevated pillow. It is exactly what I need at the beach when reading a book. I can’t imagine sitting at the beach without this supporting pillow. It makes me feel perfect whether I read a book or check what’s happening online. Now the shape may confuse you but believe me it is what a traveling pillow should be like. I know this because unconsciously I have twisted my own pillow in a similar shape. What this pillow does for your head is provide complete support. You see how the lower part rests on your shoulders and this continues to the head where it has a laying part for it. It’s like a natural extension of your shoulders. Another thing that I don’t like about the classic U shaped travel pillows is that the part behind your neck is usually too thick and this pushes your head forward. So they solve one problem but create another one, admittedly smaller one but it is still not the best solution. 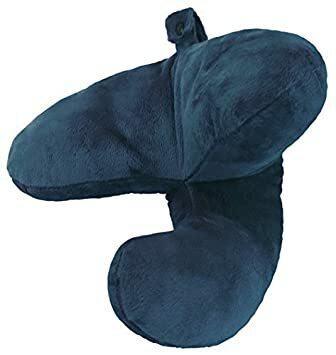 The above pillow solves it all and I warmly recommend it if you want to buy the best travel pillow. If you like you can make sandwiches at home and pack them for a beach snack. I admit I am a bit lazy to do this so I buy my food, there are several small restaurants near my beach so I don’t bother too much with the food. If you decide to bring your own food just make sure it can endure high temperatures and not get spoiled. It is branded as well – it is a “Go Travel” product. I first got to know this brand in the free shop on the border where we regularly stop. The products are supposed to be cheaper but in my experience even if they are a bit cheaper they are still quite expensive. But I did buy myself a few “Go Travel” products. This bpa free bottle is one as I really needed one not just for the beach but for climbing mountains as well. 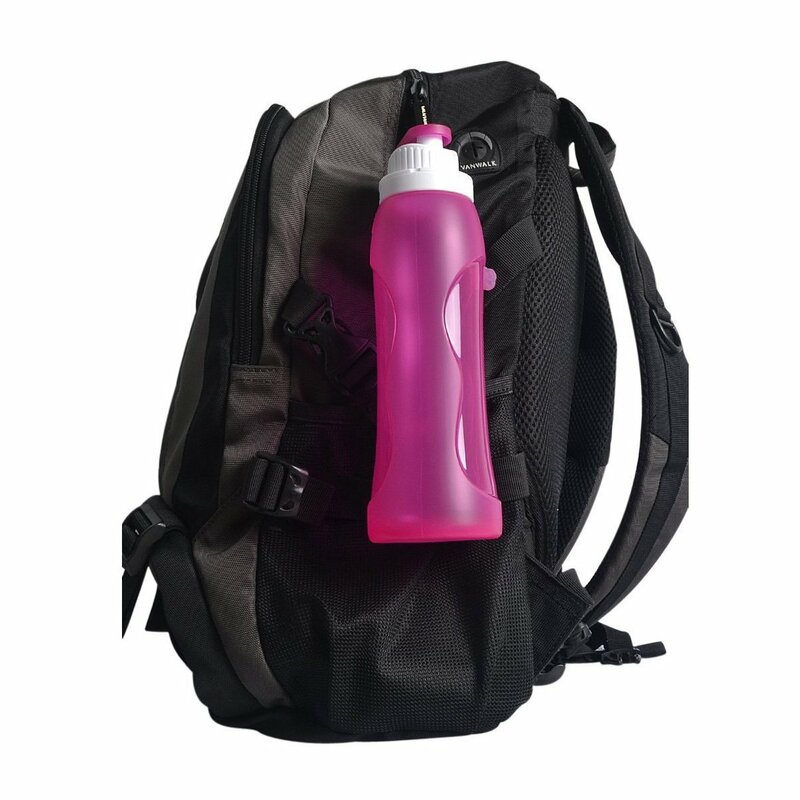 This way I can have a sip of water without having to dig in the backpack: I just hook the bottle to one of the backpack straps and it is a perfect solution for me because I do drink a lot of water. If you don’t really know what is BPA then know this: it’s a hormone disruptor that is related to reproductive, immunity, and neurological problems and is especially harmful for children and babies. It is best if we don’t use plastic at all but since that is almost impossible I like at least choosing products that reduce the toxic influence on the human body.